Often, the only connection between an EMS vehicle and the base station is through radio, offering a limited view of any situation. SkyHawk Telematics provides a real-time view into emergency vehicles, increasing driver safety while enabling operational efficiency. Through Driver Identification, lone workers can take comfort knowing the environment they’re entering as the AVL solution provides real-time information for harsh events, over speeding or team member down. While on duty, real-time vehicle tracking notifies the base station of hours of service, idle times, siren state, location and speed. ECM data integration enables the ability to properly schedule regular maintenance and identify error codes minimizing vehicle downtime. Customized historical & managerial reports can help optimize fleets by offering a detailed view into fuel consumption, fleet utilization, and maintenance. 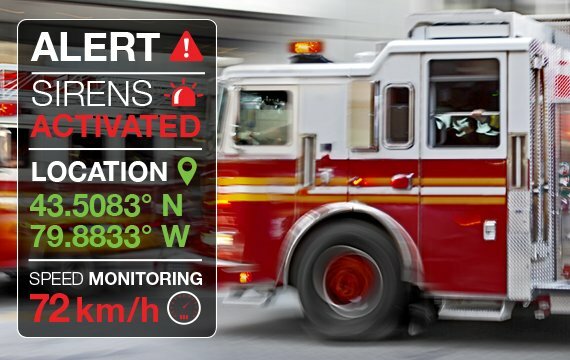 Managing a fleet of emergency vehicles through SkyHawk Telematics can improve operational efficiency and worker safety.